Kritou Terra Villa is a charming traditional stone house, Built in the early 1900's with a private swimming-pool located on the outskirts of the village of Kritou Terra near the holiday beach resort of Polis. Set in a beautiful garden full of bougainvillea, jasmine, rose, geranium and wild flowers, as well as nut, fruit and jacaranda trees. This is in the quieter area of the west coast of Cyprus near Polis. 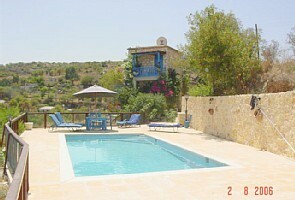 This villa has its own swimming pool and is well away from the madding crowd, with the nearest neighbours being 250m away. With 360 degree views of the surrounding countryside, including the coast of Polis to Pomos, Kritou Terra village and the Troodos Mountains, the villa's peaceful atmosphere and away from it all location makes it a perfect family holiday venue, perfect for nature lovers , hikers and cyclists. In the garden is a barbecue, swimming pool and parking. terrace, 5 garden chairs and 5 beach chairs. The Bedroom Downstairs has a Large Double Bed: This bedroom has air-conditioning, a king-size double bed and is on the ground floor. A double sofa-bed is also available in the living room area. The Bedroom Upstairs has two Single Beds: This bedroom with twin beds is located on the first floor, has air-conditioning and has its own extensive veranda, with spectacular views to the coast, the Troodos mountain range and the village of Kritou Terra. 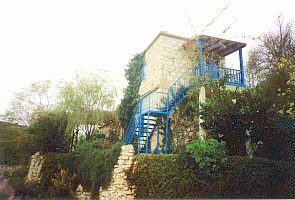 It is accessed by an outdoor staircase. A baby cot is available if required. There is an open plan kitchen and living room area with a fireplace (wood provided), and outdoor dining can be enjoyed underneath the vines on the veranda, with easy access to the kitchen which is fully equipped with 4 ring stove, dish washer, freezer, fridge, grill, microwave, oven and washing machine. In the living room is a fireplace, sofa bed and seating for 5 people. There is a child's highchair in the dining area with seating for 6 people. There is an audio tape player, CD player, radio, Satellite TV, DVD player, There is also a Computer available with free broadband Internet access. There is a phone. All bed linen, bath towels and beach towels are provided. Children are welcome, pets welcome, unsuitable for the elderly or infirm, totally wheelchair inaccessible. 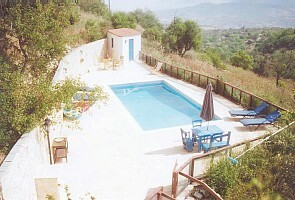 Kritou Terra Village is surrounded by fertile fields of olive and almond trees, which completely surround the house. The charming old village of Kritou Terra is just a few minutes walk away. Plentiful water from a natural source means that the village itself is always green, even in the full heat of summer. A hillside village set amidst fruit and nut trees, the village has a Byzantine church dating back to the 7th century (Ayia Ekaterini), and an ancient Roman road which used to connect Paphos with Polis. It is a two minute drive to Droushia village, which has several tavernas and shops. 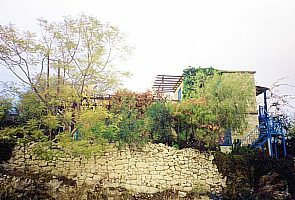 Life in the village is still very much based on agriculture, and follows the seasons: citrus harvest in Spring, wheat in the Summer, with the annual olive, walnut and grape harvest in Autumn. Traditional crafts such as weaving, basket making and baking are still common. Enjoy a Cyprus coffee in one of the two traditional coffee shops, or a meal in the local taverna, there are also two grocery shops in the village. 10-minute drive to Polis, 20-min drive to Coral Bay. Free Car Included: A Toyota RAV4 J (automatic) is provided free of charge for the duration of your stay. It is a comfortable ,air-conditioned 5 seater. Full comprehensive insurance is included for drivers aged 25 to 70 years of age who have held a valid driving license for at least 3 years. Please note that this does not cover any accidents or damage due to off-road driving (i.e. rough terrain). This is not allowed. Please note that a car is essential for the duration of your stay, unless you wish to spend all your time in the village and surrounding area. Airport Pickup: Pickup and drop off at Paphos Airport is included in the price. For Larnaca Airport, there is an extra charge of EUR75 each way. For every stay of two weeks or more, cleaning, bed linen & towel change will take place once a week. Pool maintenance and gardening once a week. Extra cleaning during the week is available on request, for an extra charge. Spa Treatments available in the comfort of your villa. Choose from massage, reflexology, aromatherapy, facials, manicure, reiki or even your own private Yoga lesson. Prices & more details available on request, please book your session prior to your holiday.